View of the Abbey and parish church of St Andrew in Hexham. The oldest parts of the church date from the 7th century when an Abbey was built here by Wilfred, Bishop of York. The Abbey was rebuilt in the 12th century and became an Augustinian priory. It was built in the Early English style of architecture and is beautifully decorated with statues and ornate windows. 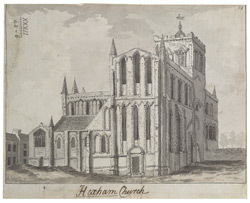 The priory was dissolved along with many other religious houses during the reign of Henry VIII, and the building has since been used as the parish church.